“We’re going to a fabulous place for lunch. It has salads, sandwiches, bagels, soups…and most importantly, desserts. Panera Bread. Yum.” I practically drooled all over myself as I drove. “Are there princesses?” Natalie asked from the backseat. Natalie didn’t seem impressed. Oh well. She would be when we got there. I was taking her on a date. A Mommy/Daughter date. I think it’s important to take kids out one on one. I’ve done this with my son several times. I have not written about it because my son behaves like a normal human being. And also, he’s pretty quiet. I led her inside and explained her choices. Natalie does not make choices quickly. She mulls them over slowly, as though it were an extremely important decision. She tapped her chin and tossed her head from side to side like a valley girl. “Do I want a sandwich? Or macaroni and cheese?” Natalie held her hands out, palms upward. It took her ten minutes to figure out that she wanted macaroni and cheese. By then I was salivating all over the place. We ordered our food and got our drinks (I did not give her a choice. Instead I went, “Look, there’s sweet tea. You love sweet tea. Drink the sweet tea.”) Our food arrived and we began to eat. I got the fuji apple salad and the summer corn chowder soup. Delish! And, yes, my flower cookie. Natalie dug into her food. Sort of. She’s also the slowest eater ever. I thought my 92 year old grandma ate slowly. Natalie would take a bite, chew thoughtfully, and then take a sip of tea. By the time I was done, she had barely made a dent in her food. She also eats like a bird. She’ll peck, peck, peck, take a break, and then return to the food. I couldn’t wait any longer to have my cookie. I took a bite. Holy crap YUM! When Natalie saw how much fun I was having with my baked good, she had to have hers too. I assumed she’d turn into Cookie Monster the second she took a nibble—I mean, it takes all my restraint not to turn into Cookie Monster because the cookie is seriously amazing—but no, she chewed and set her cookie down. I engaged her in conversation as we ate. Natalie pecked at her food for awhile longer and then announced she was done. She barely ate a thing and MOST OF HER FLOWER COOKIE REMAINED! It took all my might not to reach over and swipe it. I packaged her food up because as I said, she’d eat it later. Eventually. We headed to Pet Smart next, because Natalie loves looking at all the living things they sell. We stared at fish and cats and hamsters. This is where the tears started. “I’ll take care of him!” she vowed. --Natalie would try and sleep with Ray because he was “so cute” and she’d either crush him to death or Ray would escape. We’d find his carcass months later. This would make Natalie cry hysterically. “RAY! RAY, I LOVED YOU!” I could picture her shouting. --Natalie would take Ray out of his cage constantly. She doesn’t always know her strength, much like Lennie from Of Mice and Men. She’d squeeze the life out of him on accident. So yeah. No hamster. Natalie was crushed. She eventually got over it and when we got home, she offered me a piece of her flower cookie. In the end, I had a lovely date with my girl. 1. My Frances would like to challenge your Natalie in a slow eating contest! 2. PetSmart=Zoo for my kids! They love visiting all the animals! 3. I am overdue for a date with my girl. Need to work on that! 4. Have a great weekend! That cookie looks so good! In my daughter's case, she'd eat the whole thing before her lunch and I'd be left wondering why I was too cheap to just buy two. This is awesome. And my daughter's dream is Disney. We'll go one day. She just got into Sofia the First. Have you been introduced? Aw! I try to go out separately with my kids, too. It's just different (and unusual) when they get the undivided attention. 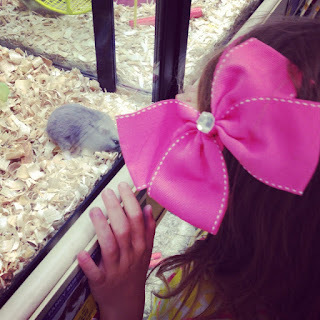 My daughter LOVES pet stores. She always wants a ferret. Ick. No way! Colin just asked for a hamster. And I was all, "Uh. No." No "Rays" in this house either. 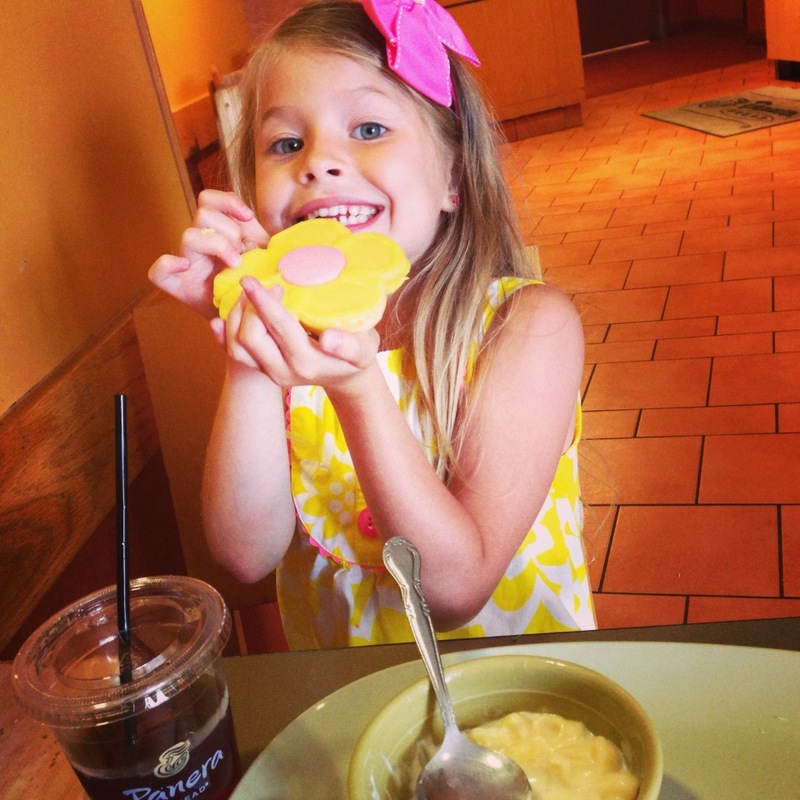 I so would have swiped her cookie. I can't wait for Penny to be interactive like that so we can go on dates! Stuffed hamsters, guinnea pigs, ferrets or any other animal that squicks me out is all the kidlets will get from me. The thought of them escaping and ending up in my bed- Oh Heeyyyyylllll NO! I don't cope well with little rodents. Totally, totally, TOTALLY agree with you on the "no more living creatures in the house" rule. Fun times! 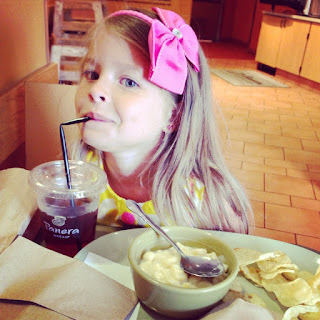 Kids should have special dates with mommy! That cookie looked delish! Who am I kidding! I'd kill for that mac and cheese, too! Aww.. that's cool. My daughter used to beg me for different pets too. We have a cat, and I gave into some fish last year though. But guess who takes care of them all? Well, Natalie is adorable and so not my kid. Except for the drama. And the desire for pets she will love and not take care of. But eating slowly and nibbling a little bit of a cookie? What are these concepts of which you speak? PS: I can't get over the resemblance to Tommy in that first picture. She looks so much older in that picture to me. Still beautiful, just not as much a little girl. Would you believe I have never had a flower cookie from Panera? And of course, now I must have one. Natalie cracks me up. Good for you for staying strong on the no-hamster policy. Her hairband matches her cookie! I would hate to have a hamster, they look too much like rats to me. It's clear that you really see your daughter for the unique individual that she is. Lovely. Oh my gosh! "He's my ray of sunshine!" How funny! You definitely have your hands full! Haha, and I thought my daughter was a drama queen. Isn't Panera just the best?! YOu describing the slow eater made me crack up. Good for you for having a date with her. Better for you that you don't have a new rodent in the house! It isn't easy raising a Diva Princess, huh?? Have one; know your pain. Still, they ARE rather entertaining, lol!!!! Love date days with my kids!! They change a bit as the kids get older. There were a few years, when we would go to a movie and I had to sit a row behind them..... BUT, they come back around!! But, the dates seem to get more expensive!